8/11/2018 - 12/4/2018In forever loving memory of a very handsome Standard Poodle named Keegan. He was a young pup when his family met him... they were ready for a new love in their life, and Keegan was the one! 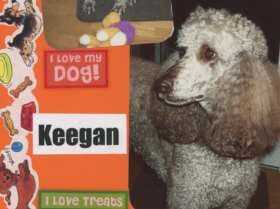 He was a wonderful family dog... the kids loved taking both Keegan and their other dog on walks and hikes. They were constant sources of joy! Anyone who knew Keegan smiled when they were around him. He loved a good snack...and he adored meeting new people when they visited his home. Keegan had an amazing life with his family!